Academic Libraries in the Digital Age. Phi Beta Kappa Visiting Scholar lecture featuring William Y. Arms, PhD. Today at 11:00 a.m. in Speakers’ Corner. William Arms is professor emeritus of computing and information science at Cornell University. Throughout his career he has been a leader in implementing innovative computing in higher education, including education computing, computer networks, and digital libraries. He has been influential in shaping the National Science Foundation’s digital library programs, including the Digital Libraries Initiative and the National Science Digital Library. Refreshments will be served. Join us, this Monday, Feb. 16 at 3:00 p.m. in room 204 for the launch of “Travels Through Greco-Roman Antiquity,” a digital humanities project created by two of Dr. Valentina DeNardis’s classical studies classes. The website uses Special Collections materials from the Library to explore some of the sites of ancient Greece and Rome. Dr. DeNardis will discuss the classes and give a tour of the website. Light refreshments will be served. Please join us on Wednesday, Feb. 18 at 2:30 p.m. in room 205 for a Scholarship@Villanova lecture featuring Megan Quigley, PhD, assistant professor in the Department of English. Dr. Quigley will speak about her book, entitled Modernist Fiction and Vagueness: Philosophy, Form, and Language (forthcoming from Cambridge University Press), which explores the intertwined history of 20th-century British fiction and philosophy. Specifically, it argues that much modernist literary experimentation connects to the linguistic turn in philosophy. Dr. Quigley’s book will be for sale at the event. The winners of our red velvet oreos will be notified today via email and announced here (with the names of lots of beloved books) in The 8:30 on Monday morning! Good luck! And, how darn cute is this! Check out the great job done by Class of ’15 Outreach student worker Molly Quinn (whatever will we do when she graduates!) on our Pop Fiction Valentines display. 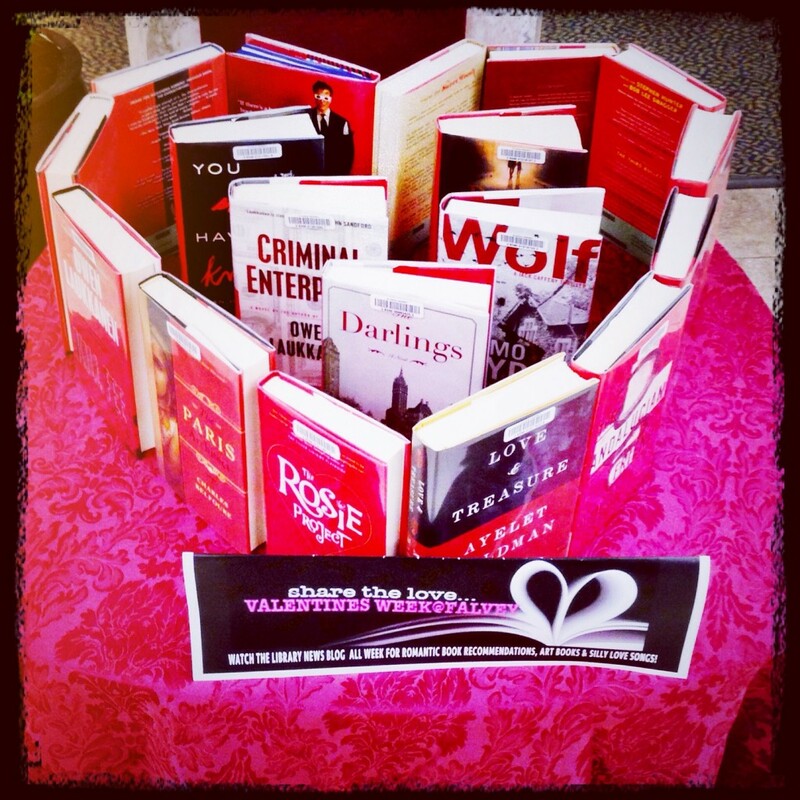 Be sure, too, to not miss the great romantic fun reads in our collection recommended by staff member Laura Hutelmyer and the great list of books loved by other staff members compiled earlier this week by Sarah Wingo in the Library News blog. 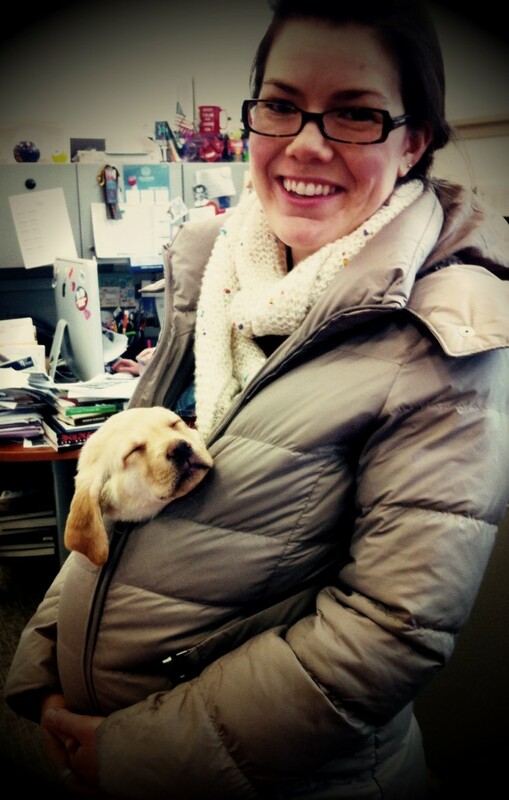 You may remember Nova, the seeing eye puppy raised by Villanova’s Matthews family and featured in our blog last fall? Well Nova’s gone off to do her good work in the world and Laura (who works for the library’s events programming team,) has welcomed Nellie, a 7 week old Labrador Retriever who will also begin training to become a seeing eye assistant for a visually impaired human. Laura brought Nellie by the library yesterday morning. 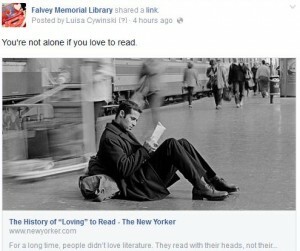 Did you catch The History of “Loving” to Read posted by New Yorker magazine and re-posted by Falvey on Facebook?